The rainforest biome is typically found between the Tropics of Cancer and Capricorn. The equatorial tropical rainforest is found within 5 degrees north and south of the equator. 200 years ago tropical rainforests covered 10% of the Earth’s surface. This has declined to approximately 5% coverage today. However, around 50% of all living organisms on Earth are found here. The equatorial rainforest supports the greatest biodiversity (number and types of living organisms in an area) on Earth. This is the result of abundant moisture and sunlight. Average daily temperatures are around 28ºc with a low diurnal (variation in temperature that occurs from the highs and lows during the day) temperature range. Temperatures rarely fall below 22ºc and cloud cover restricts temperatures to 32ºc during the day (as the result of cloud cover caused by high levels of evapotranspiration). 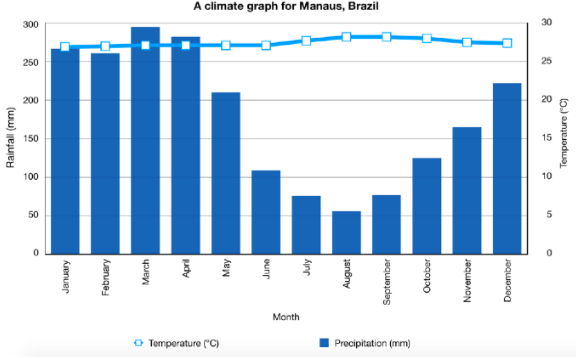 Rainfall levels are high throughout the year as the result of the inter-tropical convergence zone (ITCZ). Convectional rainfall results in annual rainfall levels of around 2000mm. Storms typically occur during the late afternoon as the result of intense heating during the day. Both high levels of rainfall and temperatures contribute to a year-round growing season. High levels of evapotranspiration create an incredibly humid environment. Figure 2. shows the stratification of vegetation in the tropical equatorial climate. The constant fight for sunlight, which is needed for photosynthesis, causes these distinct layers. 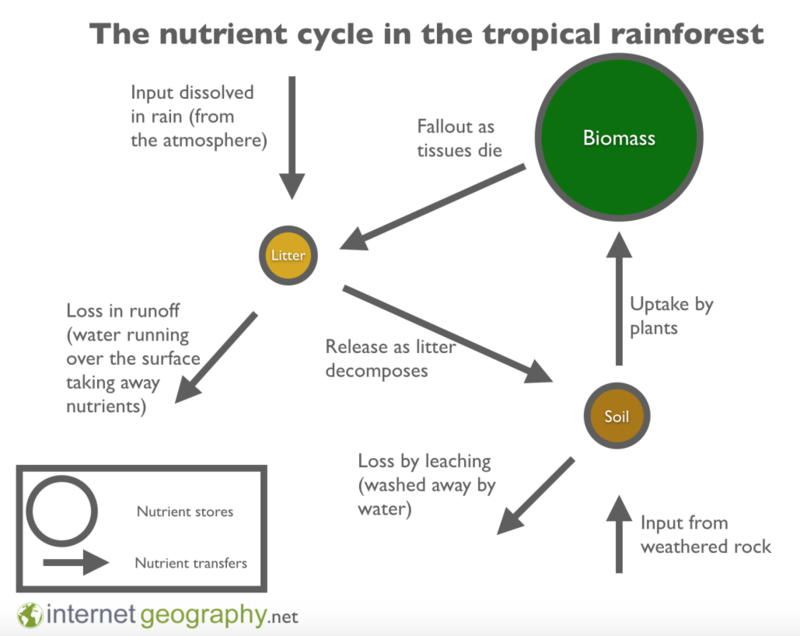 This video on rainforest structure by BBC Class Clips provides a very good overview of the layers of the tropical rainforest. Below is a summary of the features of each layer. Conditions – Maximum sunlight, rain and wind. Temperatures are lower at night. Plants – epiphytes – plants living in tree crowns for light. Conditions – trees compete for light, nearly all rain intercepted. Plants – dense, unbroken layer of tree crowns. Conditions – 15% of sunlight penetrates to this layer. Rain drips through the canopy. Hot and humid conditions. Plants – lianas climbing in a bid to reach sunlight. Conditions – 10% of sunlight penetrates to this layer. Dark, and very little change in temperature. Plants – very few dead leaves on surface. Seeds from trees germinate quickly. Competition for limited sunlight. Shrubs and herbs can be found here. Butters roots for tall trees dominate. Fungi common. Animals – decomposers populate this area. The hot, humid climate leads to rapid chemical weathering of the bedrock. In addition to this the climate provides ideal conditions for the rapid decomposition of leaf litter. However, the soils are fragile and depend upon the rapid decomposition of leaf litter for nutrients. The rapid decomposition leads to a thin humus layer. If vegetation is removed nutrients are quickly leached and the soil rapidly loses fertility.